I've written reviews for my favorite poultry and small-scale farming books. All of these are well worth reading. With a few exceptions (due to heart-stopping cover prices), all are worth buying. For your convenience, I've provided links to Amazon.com for those books that Amazon has heard of, in case you feel like ordering them, or if you want to read other people's reviews. I buy a lot of books from Amazon. They're my favorite bookseller. For out-of-print books, I've provided links to Abebooks.com, which is where I buy most of my hard-to-find books. It is becoming increasingly hard to find classic, out-of-print poultry books. Hobbyists and small-scale farmers are rediscovering them, and the upshot is that these books are harder to find and more expensive than they used to be. I started Norton Creek Press largely to make old classics available again, and I will be bringing out additional titles as time permits. Not relevant to poultry in any way! I wrote this book while I was in college, as a practical guide to people playing Dungeons and Dragons and simlar fantasy role-playing games. It has become collectible, with used copies selling for at least twice the original cover price and getting five-star reviews at amazon.com. http://www.through-dungeons-deep.com/index.html It's the book that refuses to die! And for good reason (if I do say so myself): it's the best guide on what role-playing games are all about and how to get started. I've brought it back into print through my Norton Creek Press label. The books in this list cover everything from backyard poultrykeeping to full-scale commercial operation. I've thrown in a few tangentially related books, too, such as The Egg and I and 365 Ways to Cook Chicken. 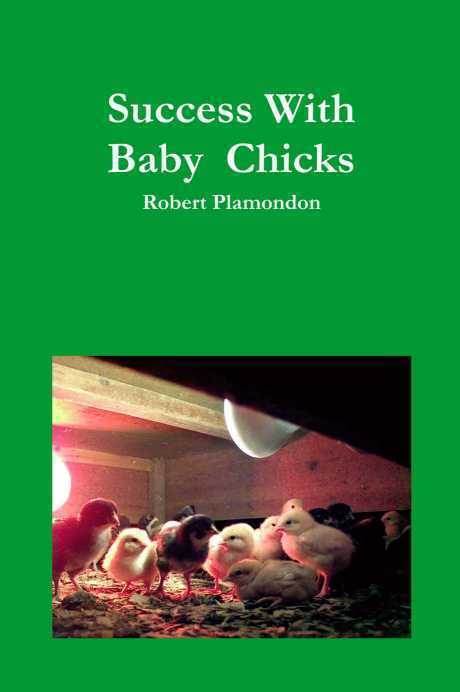 Success With Baby Chicks, by Robert Plamondon. Norton Creek Press, 2003. (Hey, that's me!) Amazon.com average rating: This 155-page book is the most comprehensive guide to raising chicks that I've ever seen, if I do say so myself. It's the outgrowth of a great deal of trial and error and almost as much library research. It reveals all sorts of practical ways of getting your day-oldchicks safely through the brooding period, and includes many Lost Secrets of the Ancient Master of Poultry that have been forgotten since the decline of small farm flocks in the Fifties. See the description here. You can order this book directly from me, or from Amazon.com. The Dollar Hen, Milo Hastings, Arcadia Press, 1909. Reprinted by Norton Creek Press, April, 2003. This is my favorite poultry book. It covers free-range poultrykeeping and practical poultry farming in a concise, practical manner, and provided me with useful knowledge and inspiration 90 years after its publication. Hastings became the poultry scientist at the Kansas Experiment Station, but was given no facilities for poultrykeeping experiments. So he decided to do a survey of how the poultry industry actually operated, from actual farm practices through wholesalers to retailers to the end user. This gave him a practical understanding of all aspects of the industry, which he imparts with vigor and acid humor. Hastings totally lacks the romanticism and impracticality of most poultry writers, and goes out of his way to kick them in the pants a few times. Hastings is also the only poultry scientist to write a classic work of science fiction (City of Endless Night, 1919). He later became active in the "physical culture" health-food and exercise movement of the 1920s. This original edition is almost impossible to find, but my reprint edition is readily available from me and from Amazon.com. Genetics of the Fowl, by F. B. Hutt. Norton Creek Press, 2003. This book is the bible of chicken breeders. Long out of print, I have just brought it back as one of the Norton Creek Classics. Hutt was an amazing man. He did pioneering work on a number of aspects in animal breeding, including work on selecting for disease resistance. The book dates back to 1949, but it is sufficiently up to date for the poultry fancier or the practical poultrykeeper. The only sizable omission is the lack of information on modern hybrid broilers, which were developed after 1949. Still, this book is infinitely more readable than the works that have been written since, and is also much more affordable. See the description here. You can order this book directly from me or from Amazon.com. 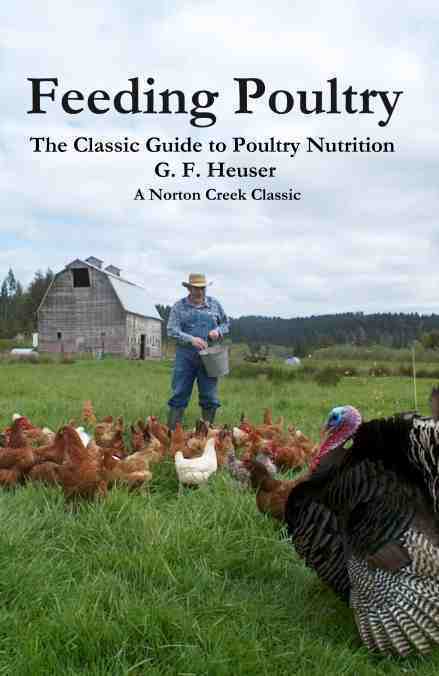 Feeding Poultry: The Classic Guide to Poultry Nutrition, by G. F. Heuser. Norton Creek Press, 2003. Another of our Norton Creek Classics. Like Hutt, Heuser was a poultry scientist at Cornell University during the early days of poultry research. 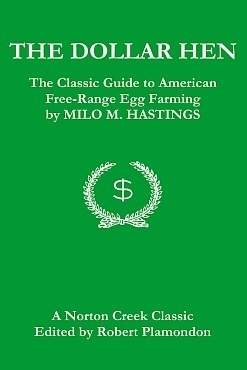 Feeding Poultry is a reprint of the 1955 second edition, which retained all of the earlier material on subjects such as the nutritional value of free range, while adding new material on topics like vitamin B-12 and high-energy rations. Thus we get the best of the old lore plus the best of the new. Much more readable than the usual nutrition book. See the description here. You can order this book directly from me or from Amazon.com. Chickens in Your Backyard: A Beginner's Guide, by Rick and Gail Luttmann. Rodale Press, 1976. This book is a perennial favorite, and why not? It's fun to read, it's inspirational, it's relatively brief, and it's inexpensive. If you've kept poultry before, you can probably skip this one (buy Storey's Guide to Raising Poultry, below, instead). But if you're a beginner to backyard poultry, start here. Storey's Guide to Raising Poultry: Breeds, Care, Health , by Leonard S. Mercea. Storey Publishing, 2000. Originally published as Raising Poultry the Modern Way. A wide-ranging overview of raising chickens, turkeys, ducks, and geese. One of the few books still in print that was written for a general audience by an Extension Poultry Specialist. Pastured Poultry Profits, by Joel Salatin. Chelsea Green Pub. Co., 1996. If you're thinking about raising meat chickens, even just for your own use, you should read this book. It gives step-by-step instructions for raising pastured broilers as a sustainable small-farm business. Designed for beginners, Salatin's methods really work. We've used them on our farm for years. Storey's Guide to Raising Ducks: Breeds, by Dave Holderread. Storey Publishing, 2000. Previously published as Raising The Home Duck Flock. Dave's waterfowl hatchery is just a few miles from my farm and we've been very happy with the waterfowl we've bought from him. His book is also excellent, going into detail on every aspect of duck raising. Highly recommended. 365 Ways to Cook Chicken, by Cheryl Sedaker. Harper/Collins, 1996. This is an excellent cookbook that gets high marks from everybody. If you eat as much chicken as we do, this book is an absolute necessity. Even if you don't, it adds power to your arsenal of cookbooks. The Egg and I, by Betty MacDonald. The classic tale of Betty MacDonald's life on a remote egg farm in Washington. It actually spends very little time talking about poultry, but it's a wonderful book that's well worth reading. Betty's other autobiographical books (Anybody Can Do Anything and The Plague And I) have also been reissued recently. Both are excellent. Commercial Chicken Production Manual, Commercial Chicken Meat and Egg Production, by Mack North and Donald Bell or Donald Bell and William Weaver. These are two successive editions of the same book, a massive reference to current commercial chicken practices. This book is expensive, but it answers a lot of questions if you're raising chickens commercially, even on a small scale. Maybe you can find it used for a reasonable price. Not appropriate for the backyarder (different focus, too expensive). These books are of interest to most people with small farms. All are excellent. The Encyclopedia of Country Living, by Carla Emery. Ninth Edition. Sasquatch Books, 1990. A monumental work with sections on just about everything, from livestock care to cooking, mixed with homespun philosophy. You can open it up at any point and start reading, and you'll be hooked. The poultry section (which I'm best qualified to comment on) is very well thought-out and practical. You Can Farm : The Entrepreneur's Guide to Start and Succeed in a Farming Enterprise, by Joel Salatin. Polyface, 1998. This is Joel Salatin's guide for getting started in farming. It came out after we'd been on the farm for several years, and it matches up very well with our own experiences. Too bad it hadn't been written before we started! Highly recommended for those who are even toying with the idea of farming. Five Acres and Independence : A Handbook for Small Farm Management, by M. G. Kains. Dover Publishing. A classic guide to making a living from a very small farm. Kains emphasized the importance of direct marketing decades before it became an industry buzzword. He recommends a diversified farm with a succession of products throughout the season, with "anchor" products of greenhouse plants, berries, fruit, and eggs. Greener Pasture on Your Side of the Fence, by Bill Murphy. A practical, accessible guide to rotational grazing based on the ideas of Andre Voisin. Rotational grazing can triple the grass yield of a pasture and reduce the livestock's exposure to parasites and disease. This book complements Joel Salatin's Salad Bar Beef, which focuses on the step-by-step implementation of Voisin's principles on his farm. Grass Productivity, by Andre Voisin. While we're at it, why not read the original? This is a fascinating book, full of insight, though not as easy to read as Murphy's book. Salad Bar Beef, by Joel Salatin. Polyface, 1996. As in Pastured Poultry Profits, Salatin provides detailed step-by-step descriptions of how he operates his farm -- this time, in his cattle operation. He describes everything from the details of electric fence management to how he direct-markets his beef to his customers. Growing Organic Vegetables West of the Cascades, by Steve Solomon. Pacific Search Press, 1985. A fascinating book about how Steve Solomon figured out how to grow all of his own food without irrigation on a farm in Western Oregon, which typically has a total drought from early July through mid-September. Solomon rediscovered a number of techniques used by old-time farmers. Full of practical tips of all kinds. Waterhole: How to Dig Your Own Well, by Bob Mellin. A short but fascinating book on how to dig a 4 in. diameter shallow well with hand tools. If you follow the instructions, you will have a professional-quality well for practically no investment. This charming book gives you a thorough grounding in the basics of well construction. The farm applications are obvious, and the benefits are also very real for gardeners or people with large areas of lawn who do not want to pay for city water. Out of the Crisis, by W. Edwards Deming. Okay, it's not a farming book, but its common-sense application of statistical methods to quality-control problems is very interesting, with innumerable applications to any business, not least a quality-oriented farm. Also, I am always amused at how Deming gives managers a hard time for griping about subordinates when the real problems have generally been built into the system, and only management can rip them out again. Here, for your comfort and convenience, are some search boxes for various booksellers. Some of these books have been out of print for more than fifty years, but they are still valuable references, especially to people with small flocks. Small flocks used to be the norm, and the first fifty years of research by poultry scientists focused on the needs of small flocks and small farms. Poultrykeeping on a small scale hasn't changed much over the years. Also, the poultry books of yesteryear were aimed at a more general audience, not highly trained specialists. To find out-of-print books, I rely on . Some of these books can be found at almost any time, but for others you'll want to set up an item in your "want list" so you'll get an e-mail when one becomes available. So far, this has always worked for me within a few months. Even the most obscure books hit the on-line booksellers once in a while. Poultry Breeding and Genetics, R. D. Crawford, Editor. Elsevier Science, 1990. Though expensive and out of print, this is the definitive reference to poultry genetics. A must for the affluent poultry breeder. This book is a compendium of chapters written by different authors, and is not aimed at the interested layman, but it is thorough. Hutt's Genetics of the Fowl is a much better read and is readily available. Commercial Poultry Nutrition, by Steven Leeson and John D. Summers. University Books, Ontario, 1997. An excellent reference book for anyone who wants to invent his own poultry rations and can afford the book's high price, though out of print and hard to find. The focus is on the creation of practical poultry feeds, not the esoterica of poultry digestion. Quite readable and accessible, given the subject matter. Although I like farming, much of the time spent in chores and driving can be tedious. To keep my brain busy, I listen to a lot of audiobooks. The cheapest source of audiobooks is your local library. My experience is that many of the best books are never actually on the shelves. People put a "hold" on them and they pass from one library patron to another this way without ever touching the shelves -- so use the card catalog to see what they've really got. For titles you can't get for free, there are many companies that sell audiobooks on cassette or CD, such as Books on Tape, Recorded Books, or Blackstone Audio Books. Most of the audiobook companies are also getting into digitally recorded books that can be played on MP3 players, which I will say more about in a minute. I only listen to unabridged recordings, which can be quite expensive on tape or CD. Many companies have a mail-order rental program, which is worth considering for those books you really want to listen to. Another option is Audible.com, which I recommend. Audible.com is basically a book club that allows you to download one or two books per month for a low price per book -- cheaper than renting tapes, in fact. I've been a member since 2001, and listen to digital audiobooks from Audible.com every day on my iPod Touch. One nice thing about Audible.com is that you can re-download your audiobooks if you delete them from your computer. Apple iPod Touch I love the iPod Touch. It's not just a music player, it's a PDA, with WiFi, email, Web browser, calendar -- the works. I listen to audiobooks constantly, and I use the other features all the time, too. I can't recommend it highly enough. With no moving parts, it's pretty rugged right out of the box, but it's not waterproof and can break if you drop it. But it's pretty safe in a shirt pocket. I added a silicone rubber cover (PDO TopSkin) which was the best one I could find for keeping out the elements and making the iPod bounce like a rubber ball, and an invisibleSHIELD screen cover to protect the glass screen. (The PDO comes with a screen cover, but the iPhone zealots at the Apple Store convinced me that the invisibleSHIELD was way better. Bottom line is that my iPod Touch has been running flawlessly for a year and a half of constant use outdoors, and I'm extremely pleased overall. If you're on a budget, I recommend the iPod Nano . I used one for years. My first one died of internal corrosion after about two years. I suppose it got damp from being carried around in a shirt pocket every day. Karen uses my second one every day, but she carries it in a little belt holster that also holds her cell phone. Sony ZS-H10CP Heavy-Duty CD Radio Boombox It's nice to have a boombox that isn't ruined by little things like dust or being left out in the rain for a couple of days. No frills, but it's rugged and very resistant to water damage. I haven't used this particular model, but it gets rave reviews on Amazon (mine is the Sony CFS914 Sports Series Boombox, which is no longer available). Panasonic RQSW44V Yellow AM/FM Personal Cassette Player. Second verse, same as the first. I like to listen to books on tape while doing chores [Update: I use an iPod for this almost exclusively these days), and a Walkman-style tape player is essential for this. I've destroyed several in the past few years. One fell out of my pocket while I was on the tractor, and the bush hog mowed it for me. (The people at the library thought this was the most entertaining, "the dog at your tape" storey they'd ever heard!). But most of them die due to getting cruddy inside in ways I can't clean out. This model is a compact ruggedized tape player that's supposed to be better in such applications. I haven't used this specific model, but I've gotten great service out of a very similar non-ruggedized version. The tape players in this product line play tapes for at least 25 hours on a single AA battery! And they're small enough to fit easily in a shirt pocket. Highly recommended. Brother LX900 Cool Laminator (LX-900). We couldn't get through the farmer's market season without this nifty little laminator. In just a few seconds, you can laminate a sign for your farmer's market booth, making it long-lasting and waterproof. There's nothing sadder than a colorful market sign made illegible by a few drops of water. This laminator is very easy to use and doesn't require heat for operation.